Getting my new Troublemaker Games Skinnerz ready for painting! Love these models, very little in way of clean up, the models are super clean. Flatbeds, Shuttles, Crushas, Beasts, Tanks, Tramplers, and Flame Vectors. Following the previous game, Andrew and I decided to try a 5000 point game. I added a flying circus of orky air power, and left off the reinforced boiler upgrade from the Gargants. Andrew added another Manta and another Riptide formation. Here's the setup, same battlefield as last time but the Tau start in top left corner! Gargants set up to make use of the roads. Tau win Strategy roll and Hammerheads and Recon manage to strip the shields from the closest Gargant. In response the Great Gargant doubles to the centre of the battlefield and blasts the Hammerheads, destroying 3 of the tanks and breaking the formation. Manta attacks the Gargant doing a point of damage, and the Gargant replies doing two points of damage to the Manta. Fighta Bombas break the Recon formation. The other Manta moves up and does more damage to the Gargant which is marked by more recon, Other Tau formations disembark and advance. Mega Gargant and Great Gargant double down the Road firing and suppressing the infantry in the ruins. While the Tau Riptides are moving to take out my left most Gargants, more Fighta Bombas come in and kill the Skyray anti-air tank from the infantry formation ahead. losing two Fighta Bombas in the process. 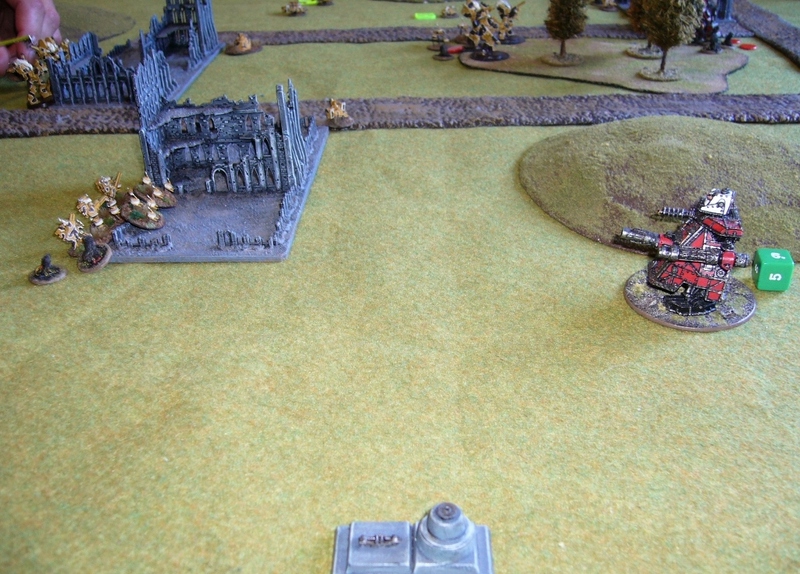 An Ork Bomba attacks the other Hammerhead formation, destroying two tanks and breaking them. The Tau Razorsharks intercept but don't do any damage to the bomber. 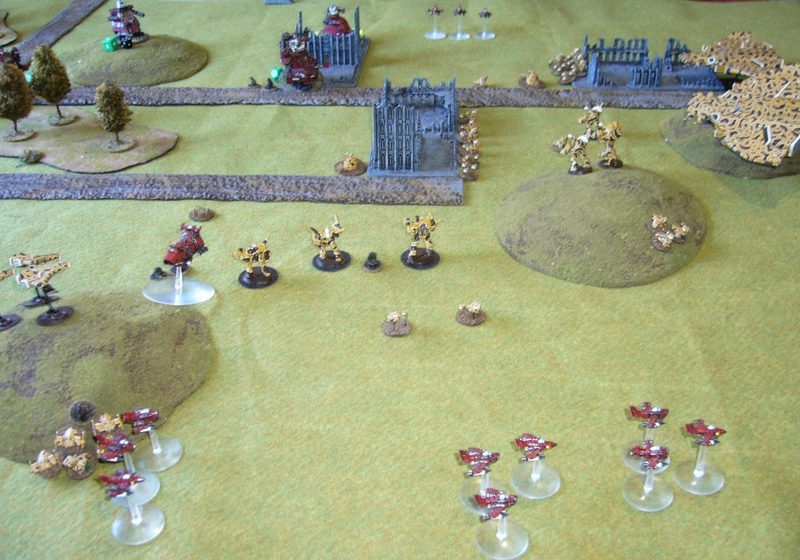 Fighta Bombas race down the Tau backline destroying broken Tau formations. End of turn, and all forces are well and truly engaged. My Gargant rallies. 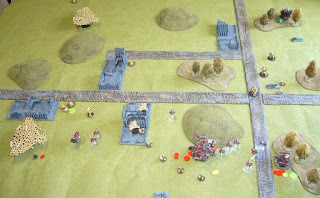 Photo from Tau side of table. Tau win Strategy Roll and the Gargant takes heavy damage, 1 hit point left! 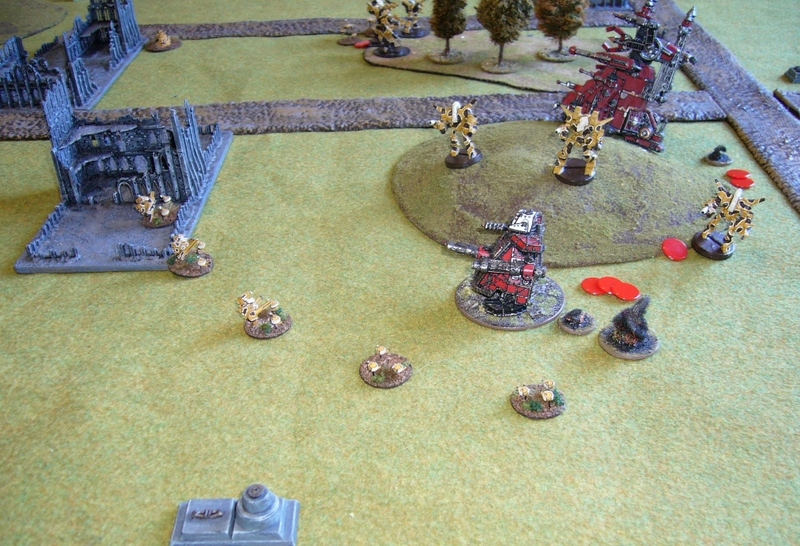 Crisis suits move in to finish it off, but only manage to break it and it retreats back behind a hill. Riptides start attacking the Great Gargant on the left flank. 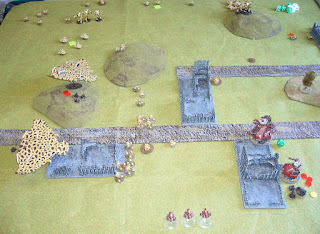 The Mega Gargant and Great Gargant waste their time trying to engage fearless Tau infantry in the ruins and woods! 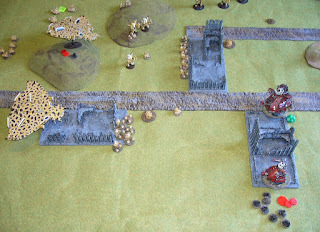 28 firefight dice from the Gargants but the Tau are tough in the ruins and many survive. My left flank Great Gargant is also broken as the Tau Spaceship arrives, and my other Gargant dies. Fighta Bombas swoop in eliminating Tau recon units, having to send three flights due to inaccurate shooting. Tau Razorsharks manage to shoot down an Ork Bomba. Things are slipping away from the Orks. The Great Gargant on the right flank engages the infantry again (which is the Tau "Break Their Spirit" formation), with supporting fire from the Mega Gargant, but the Tau still manage to survive, though only just. 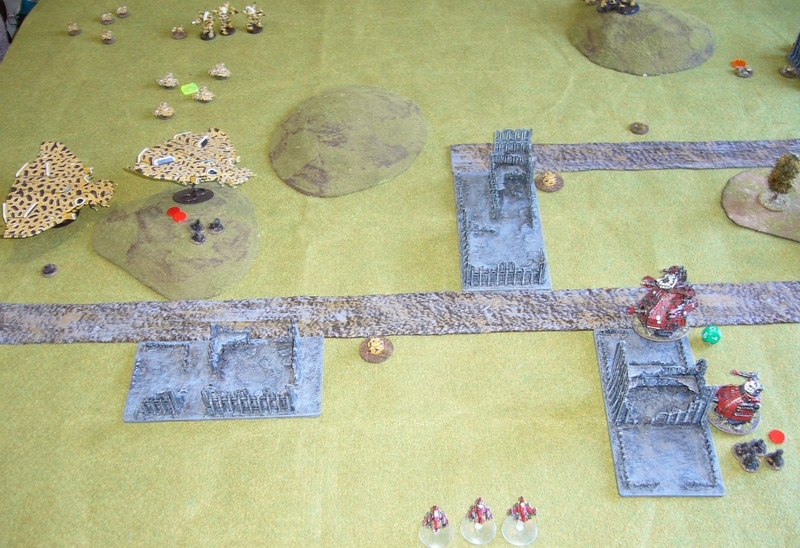 I didn't get a photo of the next dumb move by the Orks, where the second badly damaged (2 damage points left!) Great Gargant engages Riptides in a firefight, with support again from the Mega Gargant. But the Great Gargant is destroyed before the Mega Gargant can do its supporting fire! Orks are losing the battle of attrition on the left flank too. My Mega Gargant doubles back towards its blitz, shooting and missing due to inaccurate fire on the move. Orks win strategy roll if I remember correctly. 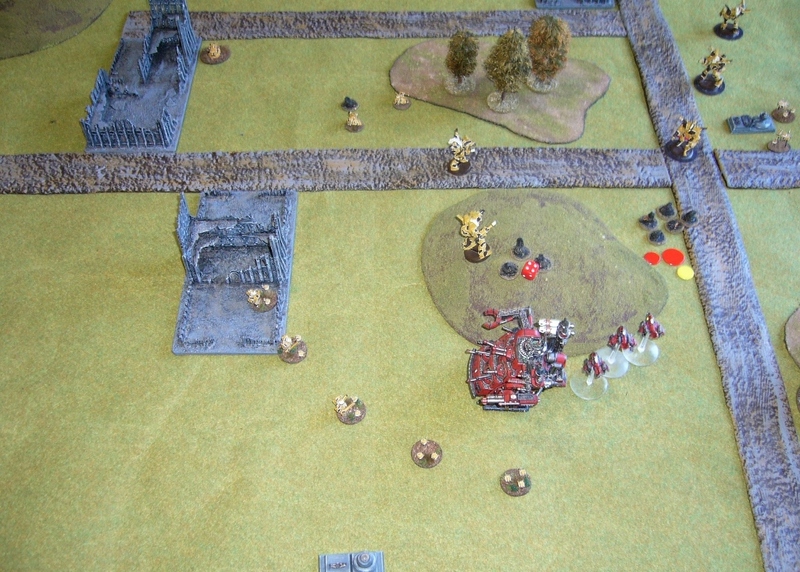 My Great Gargant engages and wipes out the Tau break their spirit objective finally. And Ork Fighta Bombas keep eliminating Tau recon and broken formations. 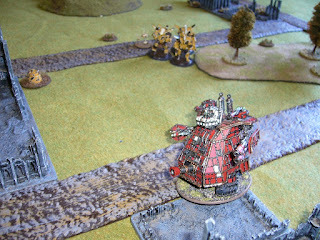 The Tau crossfire my Gargant, breaking it and it retreats burning. With the aid of Fighta Bomba attacks, the Mega Gargant manages to break through the Tau line and contest the Ork Blitz again. 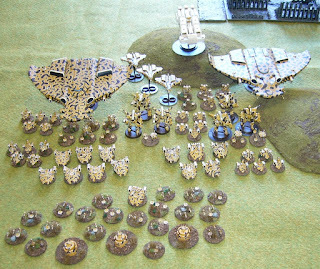 However, it now takes fire from Mantas and other Tau units. And drops to half damage! End of turn 4. Orks have "Break their Spirit" but no other victory condition, and Tau have no victory conditions. Game doesn't go another turn, so it goes to points. Tau have 3105 victory points, and Orks only 1800. Win to the Tau! 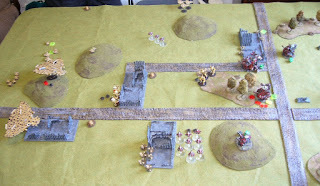 Another game using big rigs - massed Gargants this time! Playing against Andrew's Tau. I played around with several lists, and in the end went with just five huge gargants. Having only five activations at 4000 points seems kind of crazy, but what activations they are! I also wanted to test out some "reinforced boiler" special rules that are being discussed at present on Tac-coms. Reinforced boilers are an upgrade that gives gargants an extra 5cm move at present. This is something likely necessary to make the army playable given it is so slow (e.g. other titan armies have faster titans available), and something that is also characterful in an "Orkimedes" list. However there is a thought that there should be some risk to the gargants in "overcharging" the boilers. I went with a variant where every move segment you use it you must roll a D6 and take a point of damage on a roll of 1 (damage which in turn risks being a critical hit and starting a fire). I stuck reinforced boiler on four of the gargants to give it a good test. Here's my powerfield numbers. Minimal for the big three (6+D6 rolls), and average for the little guys (3+D3 rolls). Andrew took Vior'la Tau, including a Manta, and three Riptides with drones. 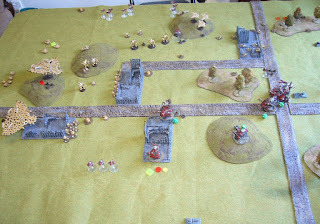 Here's the setup, Andrew chose corner deployment, and top left. He is strung out with a line of garrisons across the diagonal. His Manta is planetfalling. My five gargants cluster together near the half way point. 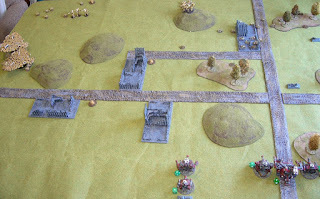 Ork objectives are one behind the Gargants and two just near the camera. Tau objectives are in the top left corner. I retain initiative and the Gatling Gargant storms to the top of a hill and blasts the pathfinders, killing one and placing more blastmakers on them and a nearby formation. Other advances with fairly ineffective exchanges of fire occur, including with the Riptides, and the Gargants have advanced to an echeloned line. Orcas and other fire strips shields from the Mega-Gargant. 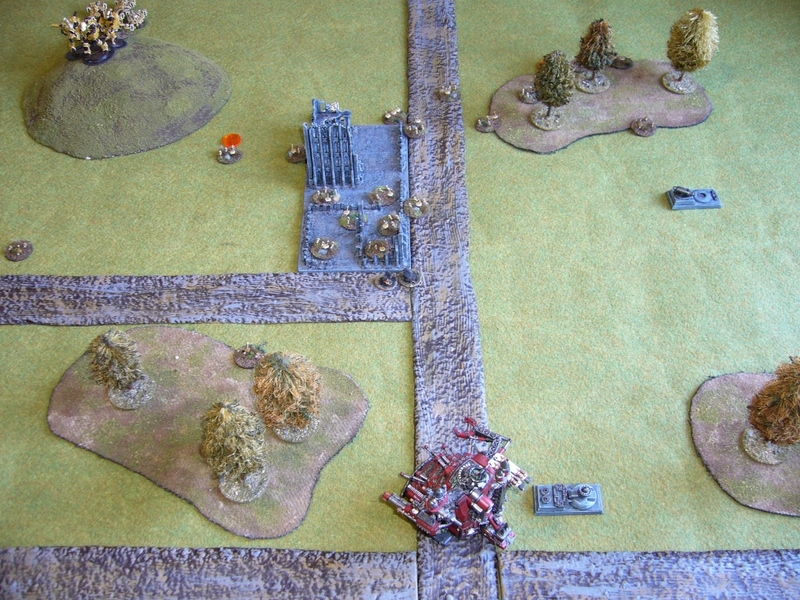 At this point the Orks are out of activations and the Planetfalling Manta arrives... 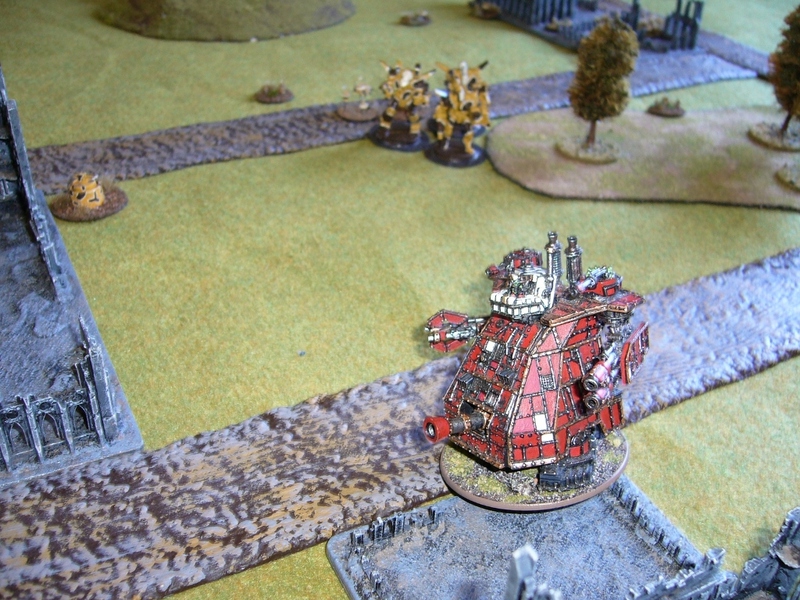 The Tau Spacecraft strips off the remaining Mega Gargant shields and manages to do a point of damage to it also. 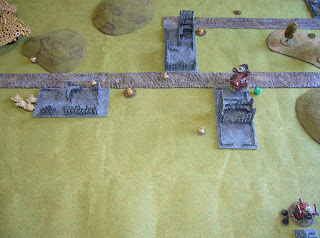 The Manta was aiming for the location between the two Ork Take and Hold objectives, but deviated 11 cm towards the Mega-Gargant. 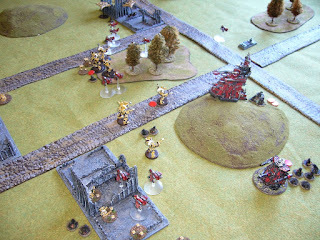 The Manta and Firewarriors and Crisis Suits blast the Mega Gargant in a crossfire. 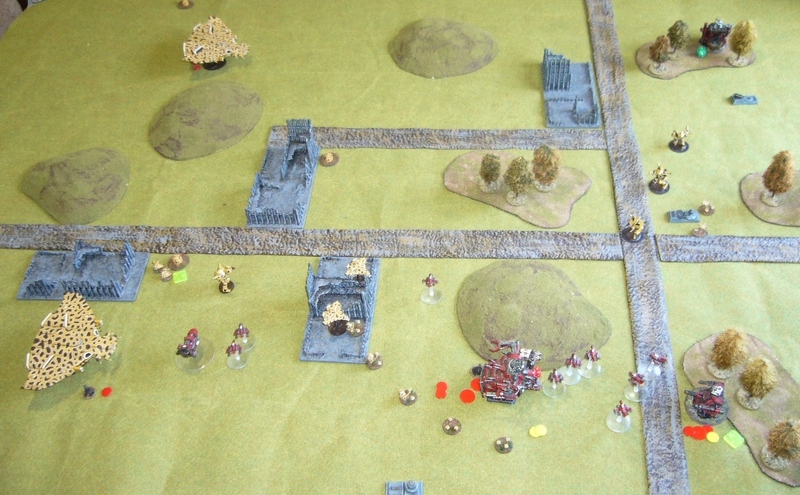 The Mega Gargant takes 8 damage and breaks, retreating back towards the Ork blitz objective. Over on Ork right, the Riptides supported by Recon units skirmish with the end of the Ork line. 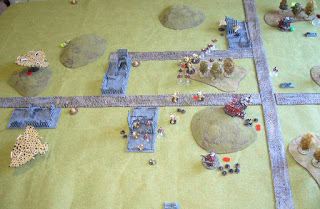 End of the turn, and the Ork Mega Gargant rallies! So do the Tau formations. 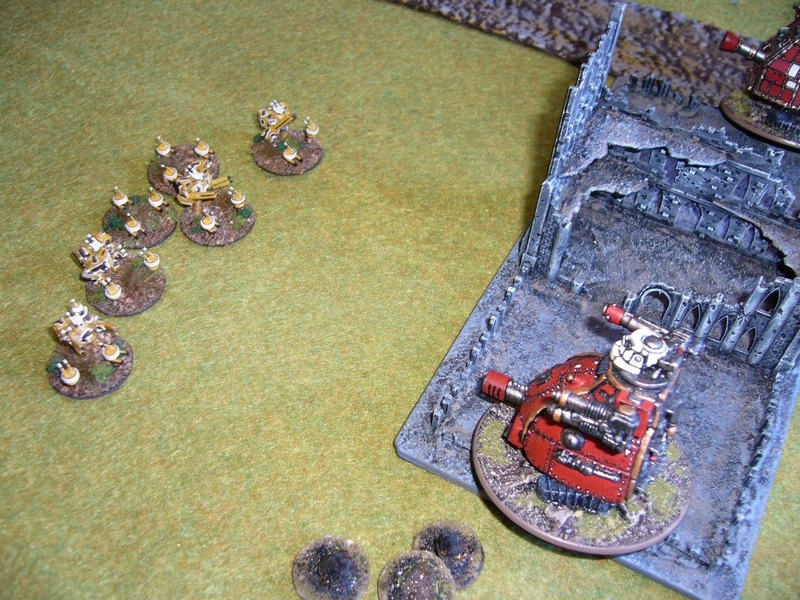 The Orks win the Strategy Roll, and for the first time in a decade the Mega-Gargant gets to unload its full sustained firepower at a perfect target. Grot missiles, Mega-cannons, Lifta-droppas, all blast the hell out of the Manta and the two unloaded formations. 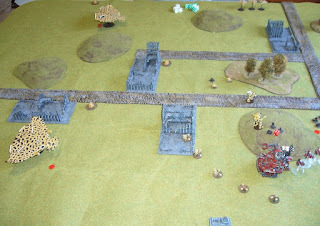 Manta destroyed and the two broken formations of Tau retreat to the ruins behind them. I retain initiative and the Gargant on the hill blasts the Riptides with sustained fire, but doing little damage in this instance. The Riptides and Recon units move in behind the ork lines, catching the Mega-Gargant in another crossfire, and causing two more damage. 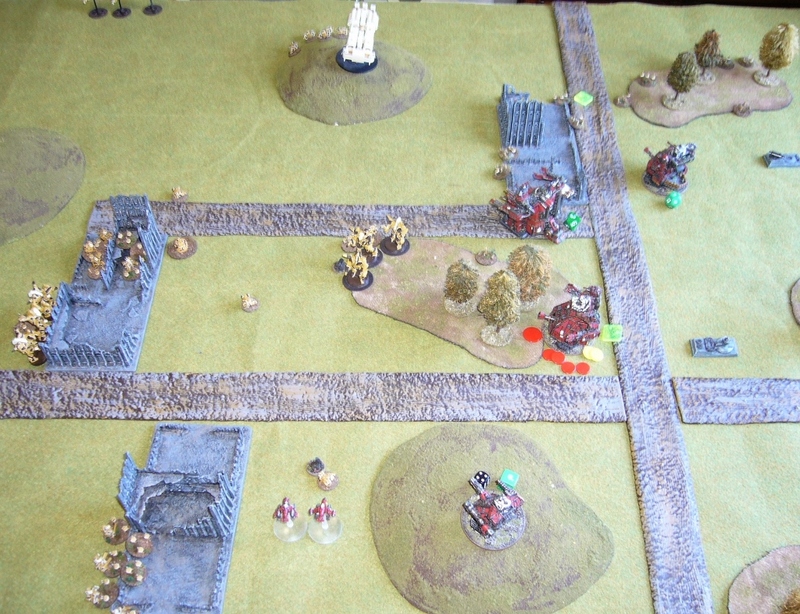 The Orks ignore them and press on, Great Gargants smash forward and wipe out two infantry formations in firefights. The Tau unload more infantry from an Orca on the Ork right, not causing any further damage though. 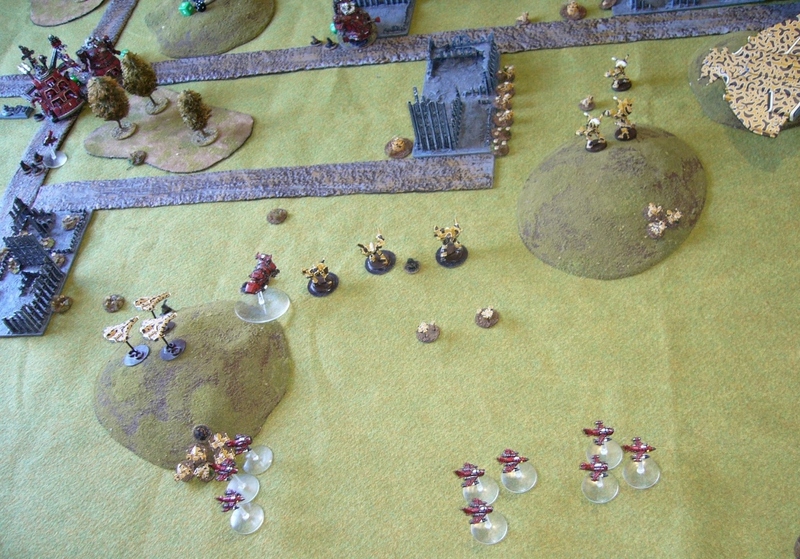 A normal Gargant charges the newly arrived Tau Stealth Suits, killing three of them, but losing the combat and breaking away towards the Tau side of the table. Finally it's had enough and it breaks forwards to put some ruins between it and the Riptides. End of turn positions, before rallies. And further over on the right. 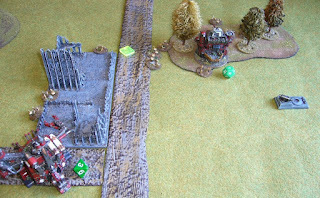 Ork Mega Gargant rallies using the reroll, but not the normal Gargant. Broken Tau formations fail to rally. Tau win strategy roll and attack the Mega Gargant again. The Mega Gargant is unperturbed, and turns around heading back towards it's blitz objective, blasting and breaking the Riptides. A little Gargant also comes back to hold the blitz objective, and blasts a nearby Tau Recon formation, just placing blast markers. Orcas and everything the Tau have throws fire at the Mega Gargant trying to kill it, but to no avail. 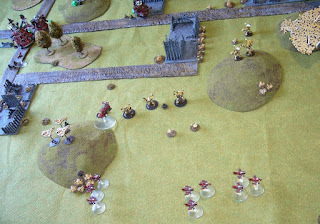 The Ork Gargants continue their stampede, wiping out another two Tau infantry formations in firefights. The path to the cluster of Tau objectives is open. End of turn positions. Ork Gargants rally. 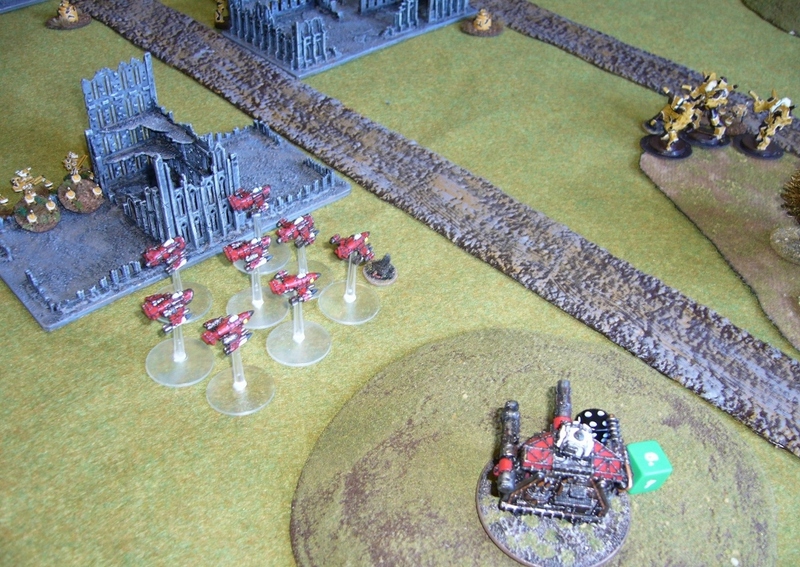 Orks have one victory condition (Break their Spirit for destroying Manta), Tau have no victory conditions. Orks win Strategy Roll again, and the Great Gargant engages the Tau formation near their blitz, breaking but not destroying them. The Mega Gargant retains, doubles and contests the ork blitz, shooting and destroying another Tau formation. The other Gargant here moves and takes a long range shot with its Deth Kannon at an Orca which has landed to contest the Tau objectives. It fails to hit. 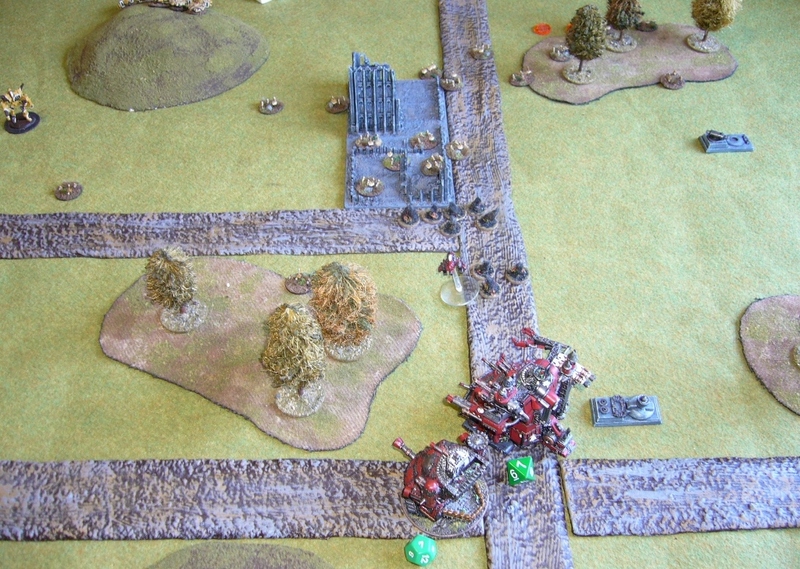 Ork Gargants are contesting all three Tau objectives here, but the Orca is stopping them from capturing them this turn. End of turn 4 and Orks have one objective (Break their Spirit), and Tau none. The game fails to go another turn so is decided on victory points. 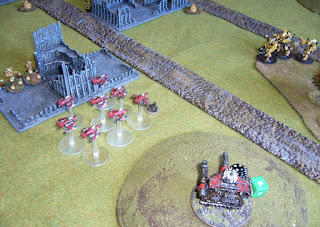 Tau gain some points for the Mega Gargant because it is under half damage remaining, but Tau losses are catastrophic, and the Orks haven't lost anything else. Win to the orks on Victory Points. Here's the Tau losses, which we didn't bother adding up. A victory at last! The plan for the orks worked here. With only 5 activations I never imagined I'd be able to win by taking objectives. Especially with Tau Orca's able to sweep in and contest things at the last moment. The goal was always to win on Victory Points by lasting to Turn 4, threatening the Tau objectives, and damaging the Tau more than they damaged me. This was achieved. The Tau came close to destroying the Mega Gargant, but couldn't quite pull it off. Me winning the Strategy Roll on Turn 2 was devastating. 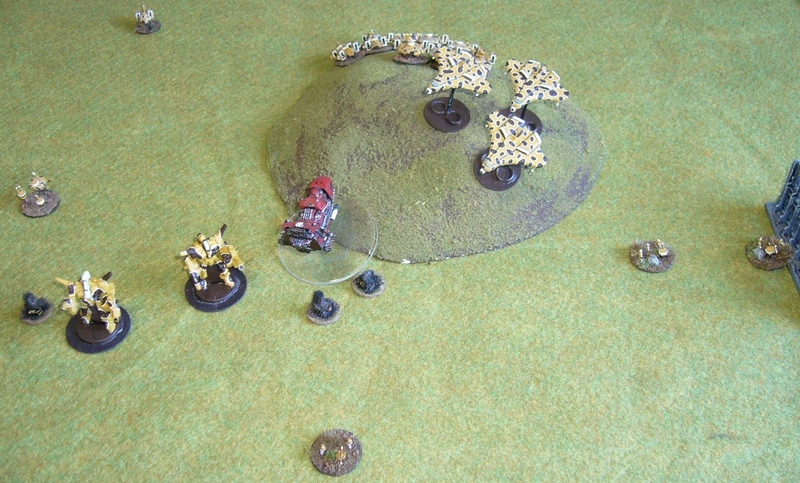 the Tau strategy was also pretty much dictated to them by the location of their drop point for the Manta, decided before they saw my deployment. Coming on so close to the Mega Gargant they had little choice but to attack it with everything they had and it also nearly payed off! Reinforced boilers were useful in a few instances here in making it to engages or objectives, but generally I was pretty cautious about using them with the damage risk rule. Somehow I managed to avoid taking damage from them all game when I did use them. 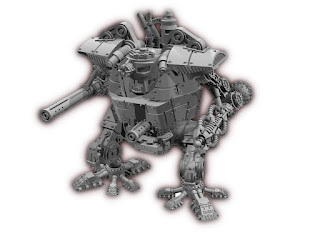 Likely some more flak on one of the Gargants would have been more useful in this set-up, but the flexibility provided by the boilers is pretty necessary for at least a few units in the army I think, as otherwise maneuverability will be fatally slow and predictable.